In This Picture I am standing in front of Courthouse rock. Reflection: Than before the fist day we crashed and smushed some man who had a fortune of gold. 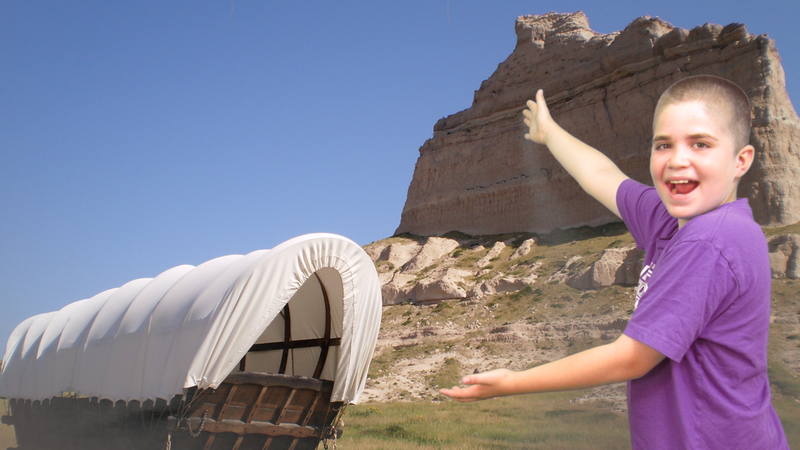 So then on the first day it was a bust because we had bought Conestoga wagons and we really wanted prarie wagons because they were lighter and wouldn't get stuck in mud and the oxen wouldn't get tired real easy. Then the first day all of us got blisters and the doctors Ada Mercado and Akemi Kataoka had to amputate Matilda Fault's foot because her foot was the worst of all. Then two days later we had to cross a dirty river when most of us still had blisters, and then Matilda Fault started to get a infection from the dirty water. Then the doctors cured Matilda Fault's infection and she is good. Then these two family's were left behind because they had a terrible sickness,and when they left Iskandar Alats. started develiping the sickness two. Then this very day Aidan was left behind with Alexandrine Haberlc because she had a crush on one boy she liked who lived in the fort. Some new bodies of water I found were some inlets. I thought that was a cool one because I have never seen or learned about an inlet. There were some. I think the reason for this is because the Arlington heights map was more zoomed in than the Illinois map. Illinois map is zoomed in and the united states map is more zoomed out. Some names of bodies of water are lakes,rivers,inlets,etc. Some bodies of water I identified were all that are listed above in the last answer. 2. Do you think Milo is a good student. Why or why not? 3.Why do you think Milo acts the way he does? 4. Would Milo be someone you would be friends with why or why not? 5. Discribed when you felt grumpy and disinterested like Milo? 1. Milo is someone who is very boring and does not do anything all day long. Although I think he will change because this book would be boring if not. 2. I do not think he is a good student. The reason for this answer is because the book told us he is not a good student. 3. I think he acts like this because he might be depressed or sad about something and he might not be able to get through it. 4. I would not want to be friends with him because he is very boring and doesn't do anything all day long. One reason I might be friends with him is because I might feel bad for him. 5. One day was when we were on the trip to Florida and the reason was because I was squished and had nothing fun to do. I was so excited to start another journey down to earth. I was already getting evaporated and it was so fun flying through the air into the atmosphere. I saw my friend Ryan getting perspired,but he had a struggle flying because he was spinning up and down and almost through up on me.Then I saw Hanna getting bumped around when she was transpired. Now I was Condensed with my fellow water friends, but the party was getting way to big and then I heard a rumble. This is the only part I hate getting precipitated. I saw so many of my friends getting smashed to the ground really hard. Then Hanna got smashed and I had the biggest grin on my face. Then I fell but got pushed back up and fell again and froze with others. Then I did this all again until I fell to the ground in a freeze ball, and the freeze ball fell right in Hanna's face. Then all of us got Accumulated into the ground and started all over again with Hanna's face smashed and a grin on mine. I think the water will be absorbed by the soccer ball. I think the water will slide down the rock. I think the water will glide right down the flower. I think the cracker will absorb the water. The water slide down the soccer ball. The water was absorbed and slide down. The water did glide right down. The water did get absorbed. I was surprised on how the water slide down the side. I was surprised how the water did both slid and got absorbed. I am glade and not surprised I got the water glided right down. I was surprised by how some of the water slide down. 1.One material That surprised me most was the soccer ball. This surprised me because I was sure of the water to get dissolved in the ball. 2. I still wonder about led. I think the water will respond by gliding down the led stick and the water will not get stuck. 1. I had got the experience to experiment on something new and on something I never new I had an interest in. It also gave me the opportunity to try something new. 2. One mistake is that I sometimes forgot what to say, and I learned from it because then I new afterwords I then new what to say. 3. I would start to see why the smarties dissolved faster in the cold water. Also to learn why the chemicals in the smarties reacted with the the water and created a layer on top of the water. 1. My experience was really fun and exiting at the same time. First of all we introduced our self and got to know a little about each other. Then we got into the fun stuff and did the game That's Me,That's Not me. I learned a lot about him and he learned a lot about me, and we actually have a lot in common. 2. My student left the room feeling really good about them self. I know this because he left the room with a smile and he laughed the hole time. We also had a good time together. 3. One thing I will do differently is not spend so much time on That's me, and That's not Me. I will try to show him more of the room. Meteorologists use water in many different ways and here are some ways they use water. If the air is above freezing, the precipitation will most likely be rain. If the air is below freezing, the precipitation will most likely be snow. When people say "It's not the heat--it's the humidity!" They're really referring to the relative humidity, or the amount of water in the air at a certain temperature compared to how much water the air can hold at the temperature. So air can hold more water vapor at higher temperatures than it can at lower temperatures. The amount of humidity in the air affects how quickly water can evaporate from surfaces such as roads,lakes,even your skin!